When choosing color you may want to start by doing a few things with the color wheel. Almost everyone has seen a color wheel. Many children are given examples in elementary school, and this may be the last time we looked at one. Other than artists and designers, few of us ever take time to study the wheel in-depth. 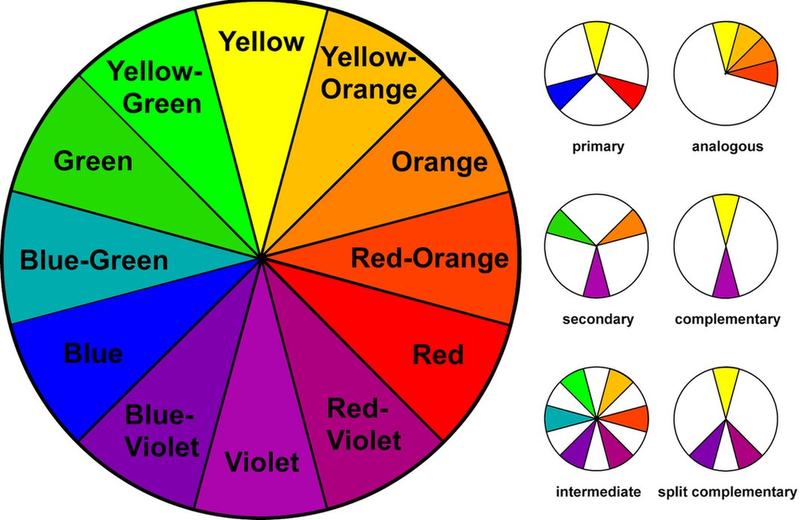 However, a little practice with the color wheel will help you learn the ways that colors speak, especially the harmony (or dissonance) of two or more colors. This can be a great help when you prepare for design and decorating projects. After you have identified your color, look at the color directly across the wheel from it. This opposing color on the wheel is known as the complimentary color. It has the highest contrast to the first color. An example of the use of complimentary colors would be Vincent van Gogh’s Noon: Rest from work. Look at the colors to the left and right of your color on the color wheel; these are known as analogous colors, meaning they are similar. An example of the use of analogous colors would be Edward Hopper’s Compartment C, Car 293. The further you move around the wheel and away from your color the less similarity they have. Think of the closest ones as brothers and sisters, and moving around the wheel you meet cousins, neighbors, then acquaintances from out-of-town. Finally, when you get to the opposing color, you might think of it as a complete stranger to the first.